This was a fast and easy salad that I decided to have as an entree instead. It makes a single serving entree or two sides. 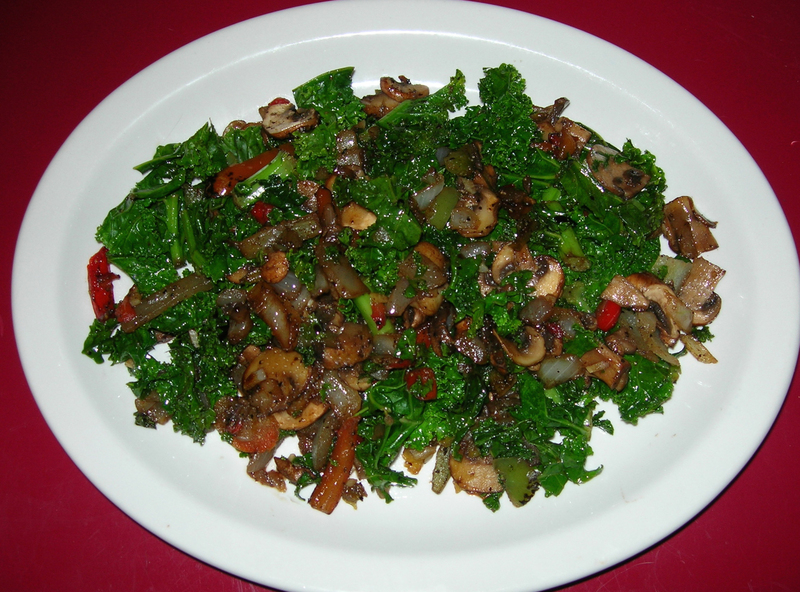 The key to success is not overcooking the kale, letting it darken in color but not cooking until it wilts. That makes the rest seem more like a dressing for the kale and keeps it fresh in taste, texture and appearance. Warm 1 TBSP of olive oil, add 1/4 cup of diced onions, 1/4 chopped red peppers and sauté until tender. Add salt and pepper. Meanwhile clean and slice 9 small mushrooms or whatever amount you need to make 1 cup of sliced mushrooms. Also mince one clove of garlic. Add the garlic and mushrooms and let cook until tender. Add a bit of salt and pepper. Finally, add 2 cups of chopped, cleaned kale and 1.5 tBSP of Balsamic Vinegar and stir. Keep stirring quickly so the kale heats evenly and quickly without steaming and wilting. Add salt and pepper to taste. It might sound crazy to add salt and pepper three times, but the secret of good seasoning is to season at each stage of cooking for the amount that you have in your pan. This will make your seasoning more effective and actually end up using less salt and pepper. This is earthy with a bit of tanginess from the balsamic vinegar. The flavors blended beautifully and would make a great side dish for something like a pork chop or beef steak, but is capable of standing on its own.